On Friday, Kamasi Washington releases his new double-album, Heaven and Earth, via Young Turks. Today, Washington has shared a new video for “Street Fighter Mas,” directed by A.G. Rojas. The clip follows Washington as he walks through a vevet rope-lined walkway into a lounge, before he enters a back room to take on a challenger in a game of Street Fighter II. (Hey, just like the title!) It’s a beautifully shot and artful clip that just happens to culminate in some video game action. “I love inhabiting Kamasi’s world, and ‘Street Fighter Mas’ was an opportunity to take a left turn and explore the surreal qualities of that world,” says Rojas in a press release. “When Kamasi told me the background of the song, how Street Fighter was a safe space for him—it took me back to the supermarket down the street from my childhood home where my brother and I would try and get in as many games before our mother was finished shopping. 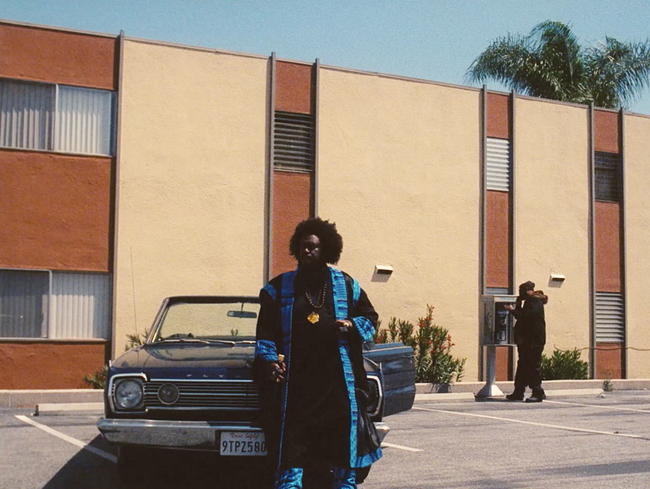 It was a true labor of love for everyone involved, coming from a desire to interpret the cinematic qualities of the track into something equally unpredictable, familiar, absurd and ultimately triumphant.” Watch the Kamasi Washington “Street Fighter Mas” video below. Heaven and Earth follows Kamasi Washington’s 2017 EP, Harmony of Difference. Kamasi Washington’s Heaven and Earth is featured on our list of the 31 Best Albums of 2018 So Far. Watch the tense video for Pusha T's "If You Know You Know"Restorations share anthemic new single, "The Red Door"